Marko Zaror broke out onto the scene with his first film Kiltro followed by Mirageman, and while both films had their problems, he showed that he has what it takes to be a major martial arts action star. This was cemented beyond reproach when he starred opposite Scott Adkins in the fantastic Undisputed 3, and now returns starring as Mandrill with his Kiltro and Mirageman director Ernesto Diaz Espinoza. So how did their third collaboration go? Kiltro was a damn odd film. It had too many flashbacks and odd moments that came from no where (especially the David Bowie moment, which has to be seen to be believed), and Mandrill has some of the same problems that Kiltro had, but unlike that film, this is a slick production, with great locations and a fantastic James Bond-style soundtrack. 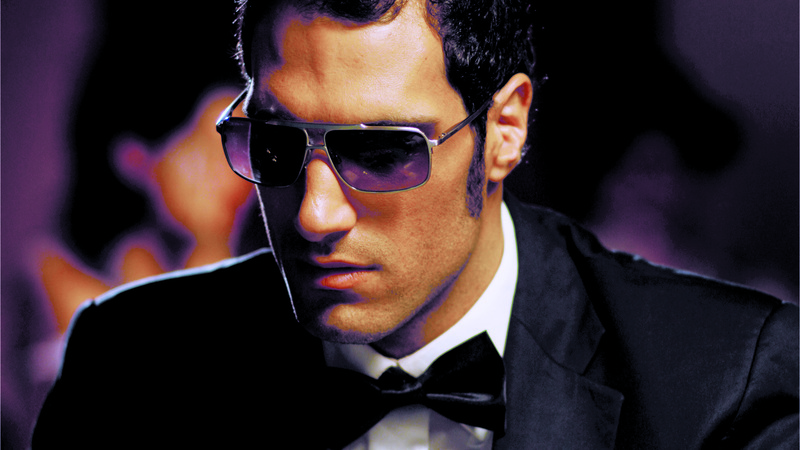 Marko Zaror plays morose very well, but this time he balances this with a sense of fun. He clearly loves playing this James Bond-style killer, and he really does a good job. His acting has improved a lot since Kiltro. Celine Reymond is smoldering as Dominque, and her transformation from a withdrawn heiress to vicious killer is fun to see. I mentioned this film was odd, and it is. The constant flashbacks to his teen years learning the art of seduction from his Uncle was downright… well it was kinda creepy. There’s also a montage sequence of Mandrill and Dominque that comes at the midpoint of the film that’s just downright strange. It all starts with a dance sequence and it’s a WTF moment that gets odder from there (is odder even a word?). The ending of the film will leave you with a mix of ‘what the hell was that’ and ‘cool!’ In what is equally strange but yet my favorite scenes in the film are the sequences where we flashback to a fictional TV show called John Colt, about a latino super secret agent that Mandrill loved as a child and teenager, and emulates in his clothing and fighting. It’s a hilarious ode to that period of time in the 60’s and 70’s when those shows were prevalent. I wouldn’t mind an entire film based around the character. The fight scenes are really top notch work. Marko has a great fight toward the beginning with Miguel Angel De Luca, who played the main villain in Kiltro, and their rematch is a much better shot fight in this film. My favorite fight involves, of all things, a dude who looks like an older security guard looking ripe for the cannon fodder chuck wagon, probably named “random old security guy #8” but it was like he decided “Damn what the script says! I’m gonna bring the thunder!” and he does, giving Mandrill all kinds of trouble that was a nice change to see: a no-name guy just bringing a fantastic fight with absolutely no warning to Marko Zaror. What a great scene! The final three-on-one fight is great as well, and shows that Espinoza has really improved his camera work over time, just as Zaror has improved his fight choreography. I won’t even get into the acrobatic moves Zaror pulls off throughout the film. For a man his size it shouldn’t be possible, but he’s simply amazing doing it. CHOREOGRAPHY: (8) Marko Zaror and the stuntmen do a great job in this film. The fights are plentiful and mixed in well with all the other goings-on. Once again, the fight with the security guard rocked, and the fight with the three final opponents was also great. Good to see De Luca onscreen again. STUNTWORK: (9) The stuntmen really came to play in this film, and do great work here, taking some nasty falls and sold the hits really well, and were even able to bring a little “thunder” to their parts. STAR POWER: (9) Marko Zaror is getting better and better with every film he does. A great new talent. I hope he appears in Undisputed 4. The sky is the limit for Zaror, and so help me Hollywood, you better not screw this up! Get this man a big budget film! FINAL GRADE: (9) Mandrill is a fun 60’s style secret agent romp with great martial-art fight scenes and a star-making performance by Marko Zaror! So when do we get a sequel?